Professors Justine Hastings and Jesse M. Shapiro of Brown University released a working paper analyzing the effects of the Supplemental Nutrition Assistance Program (SNAP) on household spending. SNAP is the second-largest means-tested program in the U.S., enrolling approximately one out of every five U.S. households. One of the first lines of defense against hunger, SNAP helps low-income people buy food each month through an Electronic Benefit Transfer (EBT) card that can be spent on certain foods at eligible retailers. The research team examined detailed transaction records for nearly half a million customers at a large U.S. grocery chain (covering 2006-2012) and SNAP administrative data from Rhode Island (covering 2004-2016). 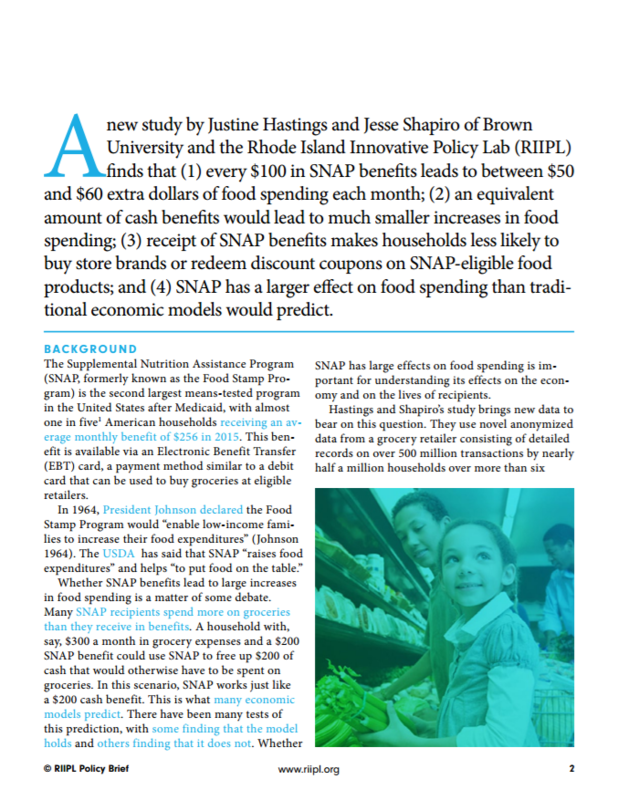 By evaluating purchases made by customers who transitioned on and off SNAP benefits, they found that every hundred dollars in SNAP benefits leads to between $50 and $60 of additional food spending each month, differing from prior research showing much smaller increases in food spending. They also estimate that for every hundred dollars in added cash income, spending on food increases by $10 at most. SNAP is one of the federal government’s largest “safety net” programs and is meant to help low-income families increase their food expenditures and “put food on the table.” How much families use SNAP benefits to increase their spending on (nutritious) foods is of great policy interest. This research suggests that SNAP benefits are more effective than cash in increasing food spending among eligible households, and may therefore have a greater impact on household nutrition and health.